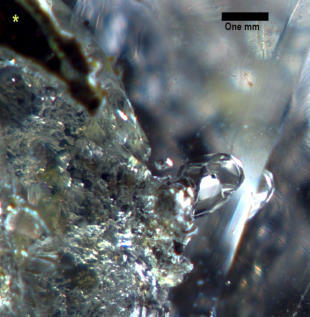 The blog entries are aimed at presenting non technical discussions of the collaborative work being done on expanding the story of how Herkimer diamonds were formed. Past blog entries can be viewed by clicking on next at the bottom of the page. The 2018 collecting season is coming to a close and it will be time for Dr. C. to dive back into his laboratory. A new 360 degree rotating/tilt stage was added to the microscope to make it easier to find those special shots. The research on Herkimer diamonds is made possible by donations from collectors. There is a particualr type of specimen which can be used for research and it’s ugly - see photo on the right. What is special about this type of specimen is that it has embedded matrix (yellow *) AND (this is critical) the quartz over the matrix is totally clear. This doesn’t mean that the crystal is totally clear, as shown in the photo. it means that there are clear windows showing the contact of the quartz with the matrix. Through these windows the early history of Herkimer diamonds can be discovered, and photographed. An example, from the specimen on the right, is shown below. On the left is a photo of a “hopper sphere”, also called birds eye sphere (see new discoveries). Matrix is labeled with a yellow * (upper left). These hopper features are a part of the crystal frost event which happened before the growth of Herkimer diamonds. 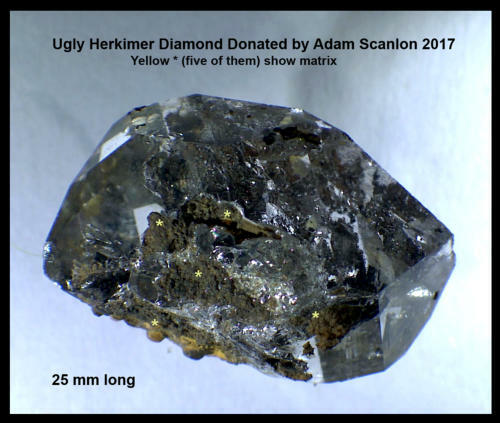 Ugly specimen donations with clear windows to viewing matrix give us a glimpse into the past and a better understanding of how Herkimer diamonds were formed.